The Corner Brook Royals are currently sitting in first place with a single point lead over the Grand Falls-Windsor Cataracts. The Royals have an opportunity to extend their lead as they will be facing the Gander Flyers this weekend with the second place Cataracts battling the third place Clarenville Caribous. With the Flyers struggling in the last few series, the Royals have an opportunity to open some space between them and their closest rival. However, the Gander Flyers have been working hard in the last week, announcing several key signings and strengthening their lineup, addressing some of the areas where they needed to show improvement. Given that the Flyers have defeated the Cataracts twice so far this season and 2 shoot-out losses, the Royals cannot be guaranteed an easy series. The early standings and performance of this year’s Central West Newfoundland Senior Hockey League teams would tend to point to the fact that the Cataracts have the tougher opponent this weekend. The Royals must continue to play a defensive game and stay out of the penalty box. Scorers Hunter Tremblay and Chris Hulit must continue to produce and play maker Phil Mangan will be a key performers for the Royals. One has to also wonder if Bryan Gillis who has been stellar between the pipes for the Corner Brook squad can continue his hot play. He has been the most standout player for the Royals so far this season, making key saves and stonewalling the opposition. If he continues this level of play, the Gander Flyers and all the teams in the league will find it a major task to get a win. There is no denying this is a critical series for the Corner Brook Royals. However, each team has something to prove in this series and fans will definitely be treated to some great weekend hockey action. The Cataracts cannot afford to drop further behind the Corner Brook Royals. With the apparent parity existing in the league between the top three teams right now, a two or three point spread between first and second may be difficult to overcome down the stretch towards playoffs. The Cataracts Cam Fergus and Collin Circelli will be keys to the Cataracts offense. 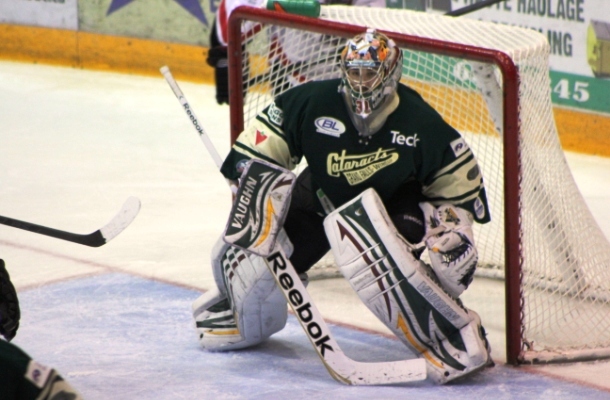 It will be very entertaining to watch them go against one of the best goalies in Jason Churchill of the Caribous. Look for the Caribous to push the action and be a little more physical to knock the Cataracts off stride, giving their own scorers, especially Andrew Sweetland and opportunity to do what he’s been dong all year – score. Saturday night, the Corner Brook Royals face off against the Gander Flyers at 7:30 pm and again at 2:00 on Sunday. The Cataracts and Caribous battle it out at 8:00 on Saturday and 1:30 on Sunday. Follow all the action on our Newfoundland Hockey Talk Discussion forum.